. : Optics & Photonics Focus :: The Ultracold Laser Show :. Thanks to recent advances in Optics, looking trough turbid materials is no longer just a simple dream of few. In the following interview, Allard Mosk from the University of Twente takes us through a backstage tour of this fast emerging research field. Drawing with atoms. Quickly steering a laser on a BEC, it is possible to arrange the ultracold atoms in any shape. This technique can clear the way for new ultra-sensitive miniature sensors for atomic interactions. Take a laser pointer and quickly move it in a circle; being fast enough, you will see a full circle, even though the laser is illuminating only a single point at each time. Laser shows in nightclubs work just the same way. This very same principle has now been applied to ultracold atomic gases by researchers led by Malcolm G. Boshier from Los Alamos National Laboratory (New Mexico, USA): they were able to draw arbitrary and dynamic potentials onto their Bose-Einstein Condensate (BEC). This new approach further extends the range where ultracold gases can be used as a tool for studying the fundamentals and possible applications of quantum physics. Since the first experimental realization of a BEC towards the end of the twentieth century, studies involving ultracold atomic gases have skyrocketed in number. At extremely low temperatures, it is possible to generate the BEC state of matter, in which all atoms act in the exact same way. 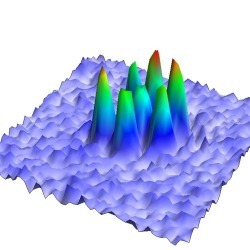 Similar to laser radiation, in which all photons are identical, such a state of matter is enormously useful as a key ingredient for a variety of research areas: from the study of condensed matter systems and the investigation of fundamental problems in atomic and molecular physics, to possible applications in quantum optics and quantum information theory. Consequently, BECs are used as a powerful and versatile tool in laboratories. Their importance and scientific significance is made evident by the fact that several researchers working in the field of ultracold gases and quantum optics have been awarded the Nobel Prize in recent years. 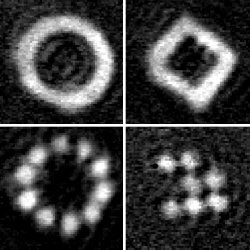 Ultracold atoms variously arranged. One setup can be used to arrange ultracold in a great variety of configurations. It even it allows switching from one geometric structure to another. Nowadays, many experiments on ultracold atomic gases in general, and BECs in particular, use optical lattices. These lattices are produced by standing laser waves with static minima and maxima of intensity. Due to the interaction between atoms and light, these minima and maxima of intensity will translate to potential wells, often referred to as sites. When these lattices are used, a BEC can be seen as a discrete system with tunneling probabilities from one site to another; similar to an egg carton containing small balls that are magically appear to hop from one site to another. In this way, condensed matter problems can be studied with an unprecedented degree of control of important experimental parameters, such as the interactions between atoms, their hopping, and ultimately the dimensionality of the system. While optical lattices are a hugely powerful tool, their geometry is typically fixed during an experiment. For example, changing from a triangular lattice to a square one in an experiment is typically anything but easy since this involves changing the number of lasers that are used to produce the optical lattice. "Put simply," Boshier explains, "we learned how to apply the principle of a laser show to Bose-Einstein condensates." When moving the laser fast enough, the atom is no longer able to perceive the motion of the laser, but merely an average potential. The condensate then becomes the projection surface for the laser and the picture that the laser draws is the time averaged potential perceived by the atoms. "We are now able," Boshier continues, "to move a laser beam fast and precisely enough so that the atoms in our experiment are subject to the effective time-averaged potential that we draw with this laser." And just like in a nightclub laser show, this setup means the laser can draw almost any pattern the experimenters can imagine. As in a multicolored laser show, in addition to drawing different patterns, the experimenters can also paint potentials with different colors, providing yet another dimension in the control of the potentials. When dealing with atom-light interactions, the important parameter is the specific transition frequency of the atom. Incident laser light is called blue detuned or red detuned if its frequency is respectively above or below that reference and will have a qualitatively different effect on the atoms. "In our experiments," Boshier points out, "we have used red detuned lasers, which created an attractive potential. In addition, we are currently working on the use of blue detuned lasers that will produce repulsive potentials." In this way, not only geometry and dynamics of the potential will be controlled, but also its attractive or repulsive nature. "What is probably most surprising about this approach," Christopher Foot of Oxford University (England) says, "is that it actually works!" Both Boshier and Foot point out that there was a lot of concern that the lasers applied to the ultracold gases would simply heat up the gas to the point where the actual experiment would be rendered impossible. Boshier's experiments have proved otherwise. Foot also remarks that many interesting studies can already be done with current techniques so that this technique might first have to find its niche or area. "Nonetheless," Foot continues, "Boshier and his coworkers have succeeded in developing a new tool for ultracold gases and it will certainly be interesting to see in what contexts it is most beneficial." "Testing the applicability to interferometry and coherent manipulation of condensates are our next goals," Boshier explains. Once this technique has matured, painting arbitrary dynamic potentials onto ultracold atomic gases will give even more freedom for manipulation than standard techniques. Similar to laser shows that are rather common today in big nightclubs, this new tool might well prove useful simply because of its versatility: "in the end, the more freely we can design our experiments," Foot concludes, "the more scenarios we can study and the more we will learn." K. Henderson, C. Ryu, C. MacCormick, and M. G Boshier, Experimental demonstration of painting arbitrary and dynamic potentials for Bose–Einstein condensates, New Journal of Physics (2009) 11, 043030 (link).